Not a sight you see every day! A buck Elk with six points on each antler with his harem! 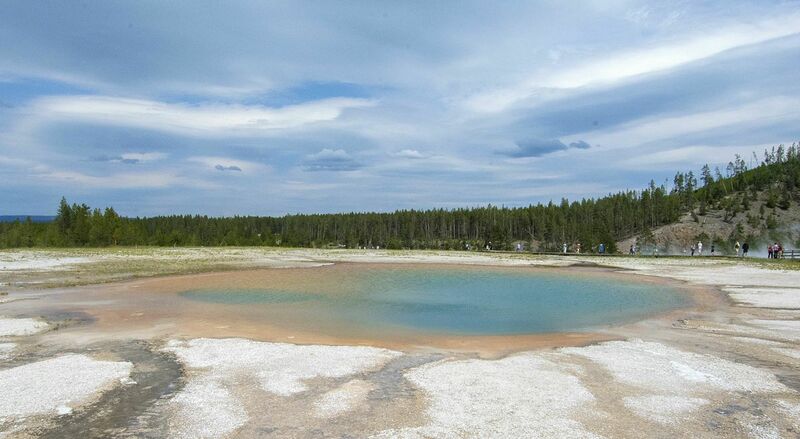 Today the main focus of our visit to YNP was to see ‘Old Faithful’ which is a cone geyser. It is called the most predictable geographical feature on Earth erupting almost every 91 minutes and each eruption can last from 1.5 to 5 minutes. The average height of an eruption is 145 feet (44 metres) with the highest recorded eruption being 185 feet (56 metres). It is the most viewed geyser in the Park and each time Old Faithful erupts there are hundreds of people there to record the event. We also went to have a look at Grand Prismatic Spring. 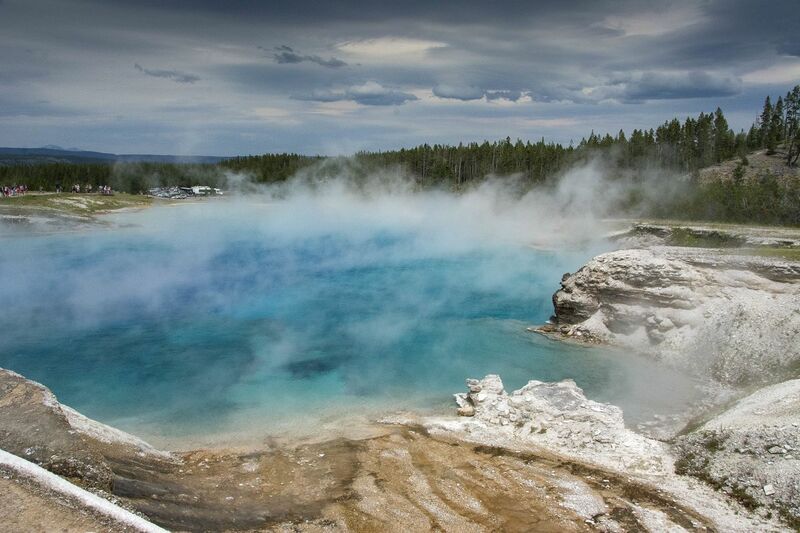 It is the largest hot spring in the United States and the third largest in the world The lake is known for its turquoise colour and so our ‘resident photographer’ was rather disappointed not to be able to see it due to the rising steam. 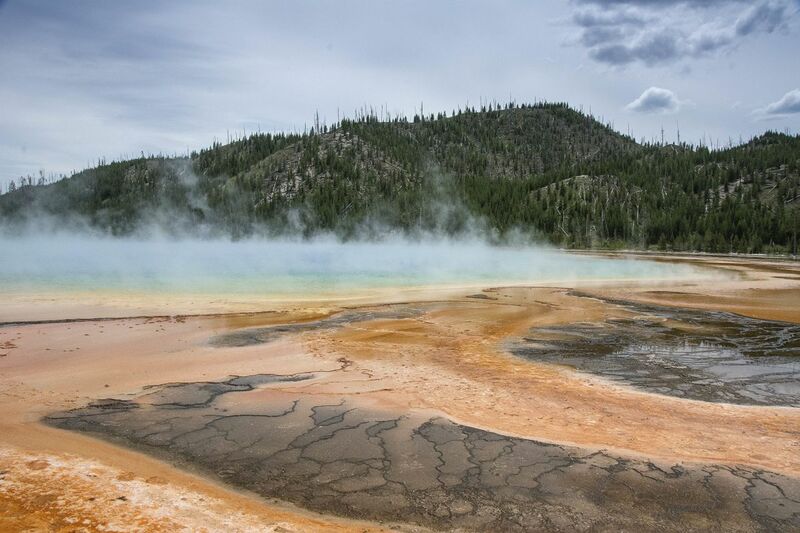 As you travel round the Park, Yellowstone has so many different faces, meadows, mountains, rivers, streams, lakes, canyons and rolling hills it’s no wonder that it was made the first National Park. It covers over two million acres!! 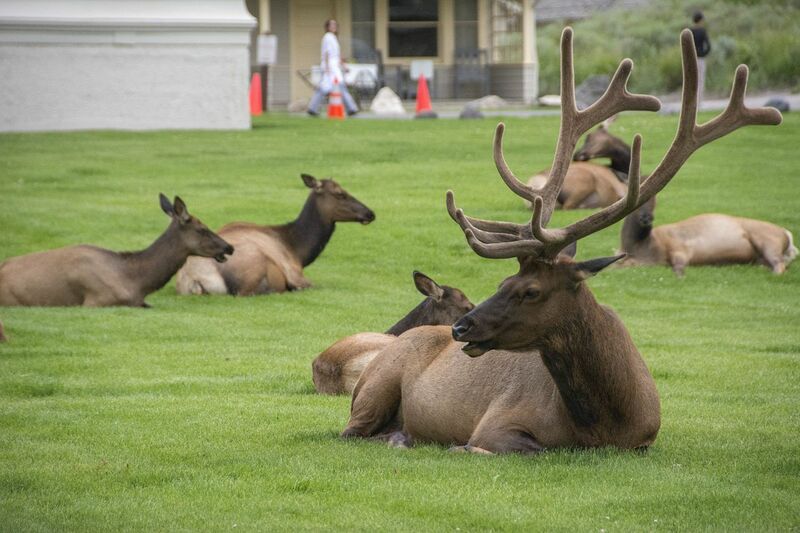 We were lucky today to see a Buffalo treading the highway and a big buck Elk with his harem, they decided to spend the afternoon sitting outside the Mammoth Hot Springs Hotel. The last picture is of a small lake we pass when we drive down the mountain ….. we’ve christened it ‘the fishing hole’. What a trip! What pictures! Competition nights will never be the same again! Enjoy, enjoy. Hi Malcolm, thanks. Glad you are enjoying them. 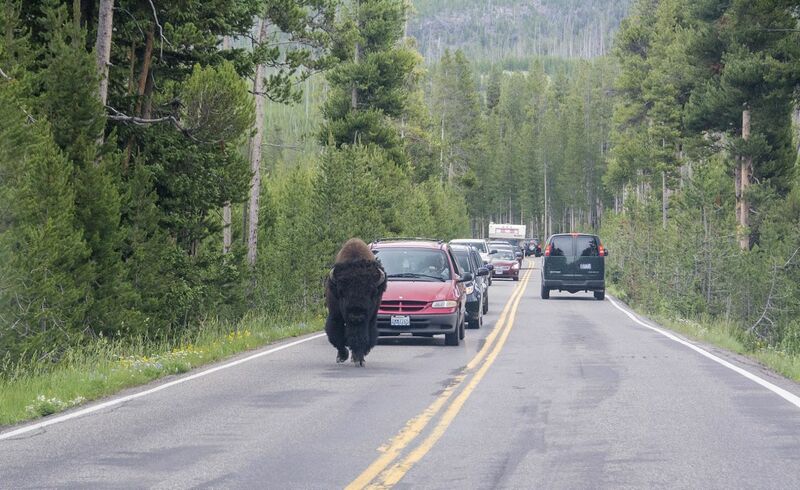 Now you’re really seeing the wildlife! 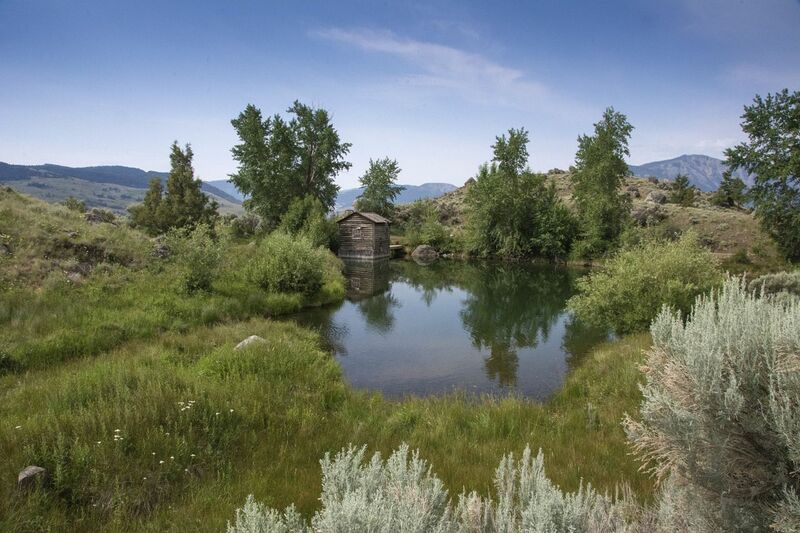 Fantastic photos, love the elk and buffalo…and your fishing pond is so beautiful as well! Si must be loving all these photo ops he’s getting now! You’ll have to make a book! I hope you get a chance to drive Beartooth Pass from Cooke City Mt to Red Lodge. We drove this back in June. it is one of the top scenic drives in the US. Ilove reading your post and seeing your photos. Hi, I’m sorry I don’t know who you are as you didn’t leave your name but thanks for leaving a message. We did get to do the drive and it was surely magnificent. Glad you are enjoying the blog. Glad you enjoyed Beartooth Pass. I hope you enjoy Rapids City The Badlands are awesome. Thanks Lisa. 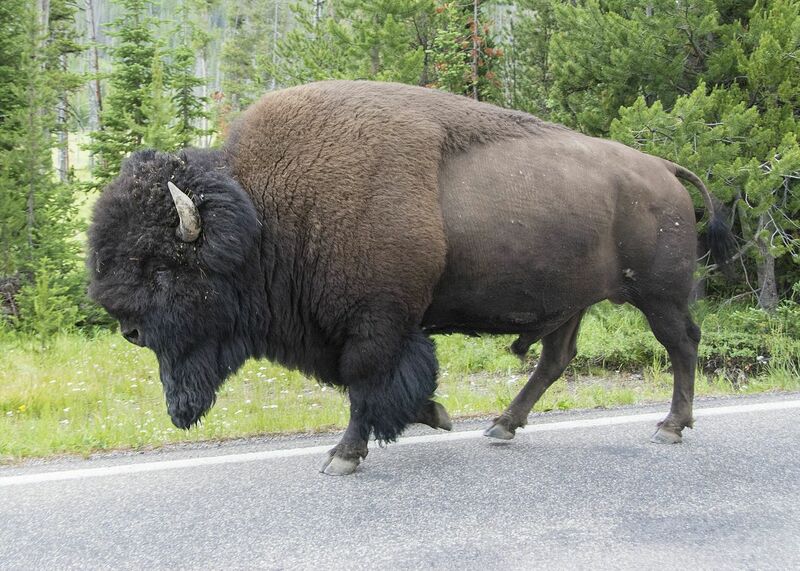 We will be visiting The Badlands tomorrow. It sure is beautiful. The elk were fantastic. 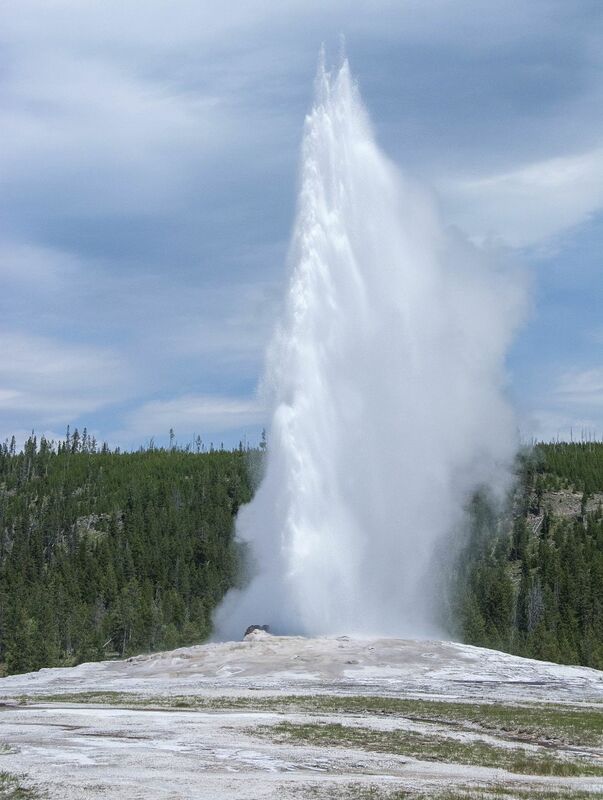 I forgot to mention that I was glad to see that you got a photo of the Old Faithful shooting up and out! That must have been some sight to see! Yes, Old Faithful was something to see.